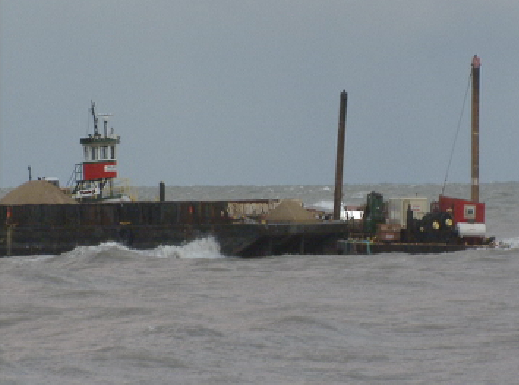 A work barge and tug went aground on Lake Michigan in high winds and 8 foot waves near Glencoe, Illinois. The barge had run aground on a shoal some 100 yards offshore. When the tug tried to free the barge, it also ran aground. As both vessels began to take on water, the captain and 2 crewmen onboard were airlifted off by the Coast Guard. The tug was loaded with 3500 gallons of diesel fuel, but no pollution reported at the time. The provincial ferry Marine Voyager collided with a fishing boat off Boar Island near Burgeo, Newfoundland. The ferry had left Burgeo and struck the anchored fishing boat. Reports state there was light fog in the area, but that visibility was good. The fishing boat suffered minor damage and no one was injured.